Competitive exams are different from the regular ones due to its cut-off. In fact, this factor becomes a game changer for most students. Where by giving the regular exams, almost all students qualify to the next level; the competitive exams restrict a major chunk of the aspirants. Hence, to ensure that you easily crack such exams, you must take a unique approach during your preparation phase. Project Management Professional (PMP®)exam like any other competitive tests; demands for such a strategy. Most PMP® aspirants have a tendency to get into the best quality PMP® books, learn the concepts by heart and keep revising the pages time and again. Having done so, they feel more confident about their exam and end up scoring low. Some of such aspirants also take up specialized MCQ books and learn the questions and answers without getting deep into the topic. Sadly, in both these cases, people fail to realize that the book also has its limit. Well, you can very well count the pages and so the number of questions. Thus, if you finish reading the questions from one book, you need to buy another one, which increases your cost; keeping your knowledge half-hearted. So, the need of the hour is to move strategically and make sure that you have a steady progress. The Online PMP® Exam Simulator with many interactive features and user-friendly modules is the best substitute to the limited bookish content. Here’s how this virtual simulator can bring a positive change in your exam preparation and rapidly take you towards success. While books confine you within its pages, the online PMP® Exam Simulator ropes you in its endless question sets. 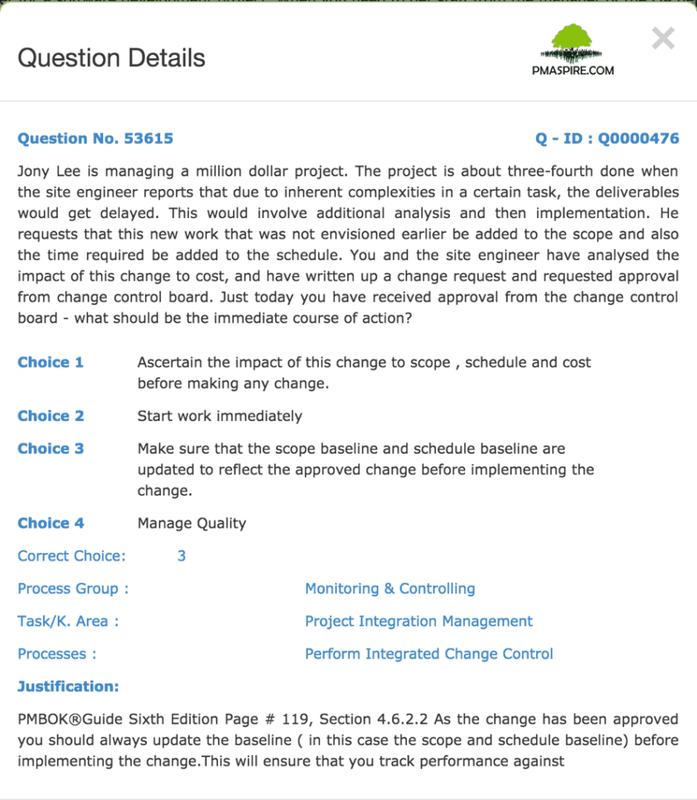 One of the best PMP® simulators, PMaspire offers unlimited full-length exam sets with thorough explanations of its questions including PMBOK® Guide page and specific section reference. Thus, it helps you to build your concepts and have a comprehensive understanding all the subjects in a short time. Besides the pre-set exam sets, you can also generate your desired question paper and gain improve your practice based on knowledge area, process group and processes. Such customization won’t be available in books. How much time do you take to solve the MCQs from book? Most importantly, do you actually set the clock of your preparation? Like most other aspirants, you don’t and it is natural as books don’t possess the capacity to assess you in a time-bond manner. Contrary to this, the Online PMP® Exam simulator of PMaspire generates all the questions in a time-bound manner. With this, you get the real feeling of the PMP® exam and improve your competitiveness in attempting questions and ticking on the correct option. In order to achieve success in a tough exam like PMP®, getting the exam interface in your preparation is most important. There is no such book in the world that can give you both textual content and MCQs at one place. While some books deliver theoretical knowledge, others test your learning. The online PMP® Exam Simulator is an amazing module that combines both textual matter and the questions. PMaspire allows you to choose from its two preparation- learning and exam sets. In the first one, you acquire more information and in the second, you question your understanding. You end up preparing more at a lesser time. It further reduces your costs and effort. Wherein books, you attempt one question set and see your performance in that set, here you can measure your progress over multiple sets spanning across a time period. The interactive graphical performance analytics takes you through your overall performance and helps you in identifying loopholes in your preparation. Thus, the online PMP® Exam simulator of PMaspire delivers 360° learning experience for your PMP® examination. Its latest study material, i.e. the sixth version of PMBOK® Guide which has been started from March 2018, is likely to continue till the next 4 years. You can also avail the free trial of its simulator and get hands-on experience before choosing a specific plan. Moreover, you can learn on-the-go, enjoy remote access and access quality content effortlessly. What more do you need? If you would like to experience a true Online PMP® Exam Simulator for FREE. Click here for register. *PMP is a registered Trade Mark of Project Management Institute.